​Stay with us and we'll explain the magic of each site. 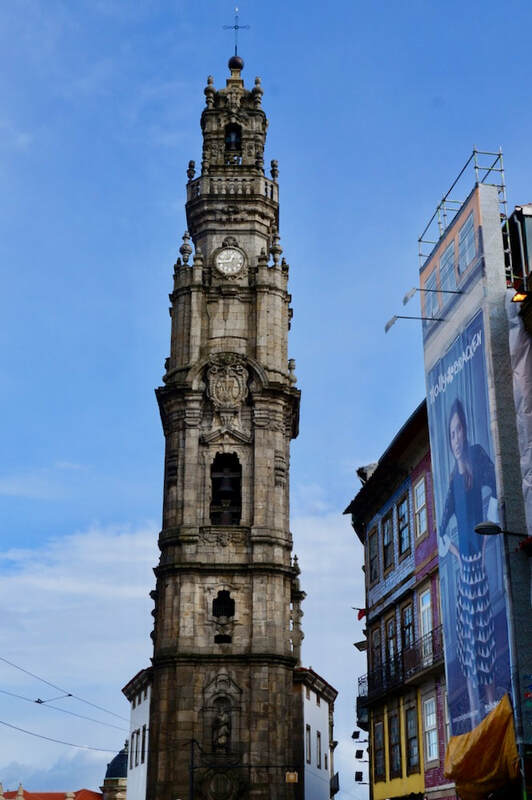 We were in Porto in December of 2017 and stayed there for over a week so we had a good chance to visit some of its major points of interest. This was not our first time in the city but, that first time, was just a drive through so we did not really have an appreciation of the place as we had this time when we stayed longer and really dug into the full range of key places and some amazing restaurants. We were mistrustful of our first view of the city the first time we were there. It seemed old and tired tired with dilapidated buildings so we decided to stay outside of the city the first days we arrived this second time. 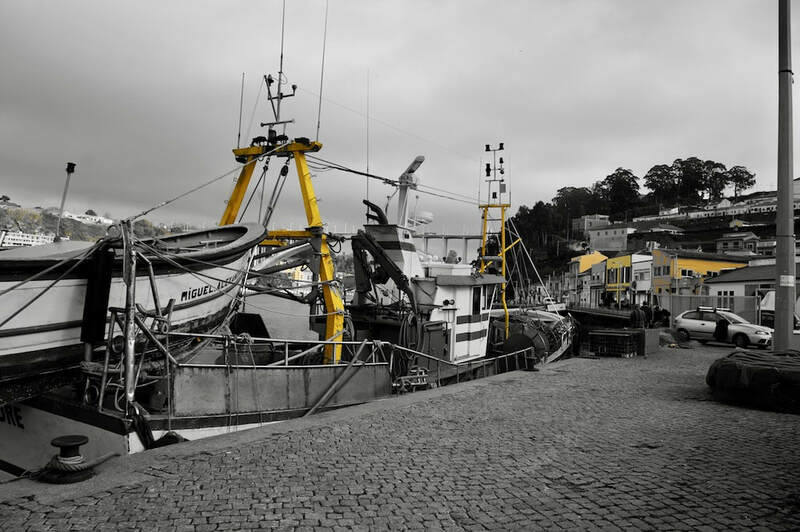 We chose to stay in a small fishing village in Vila Nova de Gaia for a few days but sadly, that did not work out as it had been let out by another person in the company who forgot to take it out of Orbitz. Ouch! So, we took their replacement but only for 2 days as it was too late to look for another room in an unfamiliar city. But early the next morning, we went on a prowl of the city, parked and lo and behold, when we got out of the parking lot to start our walk, a really dynamic vista opened up to us. It was then when we made the decision to get a place right on the river where we could take in the action and enjoy the spectacular view. Just imagine this area at the height of Porto's commercial enterprise. The Duoro is still busy and from this vantage, it is fun to watch the amazing variety of boats, now, mostly ferrying passengers and not the export goods as in the past. 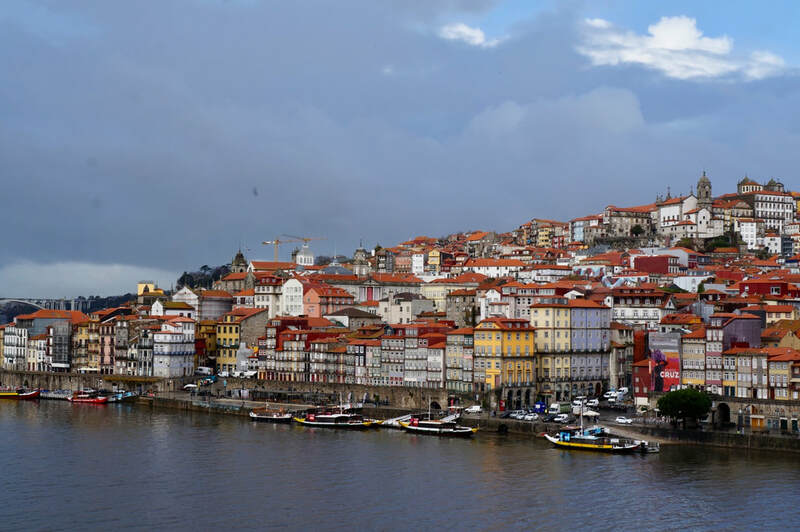 As such, the Ribeira is lined with restaurants, cafes, bars and shops all catering to the many tourists who come to Porto. Many of the visitors were Portuguese and Spanish, so it felt like a new city. 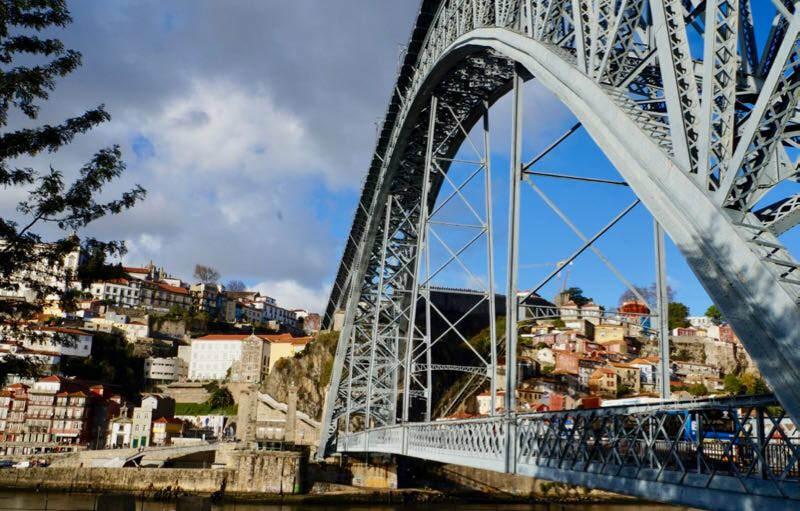 The spectacular Dom Luis I bridge immediately draws your attention the moment you reach the city of Porto on the Duoro. 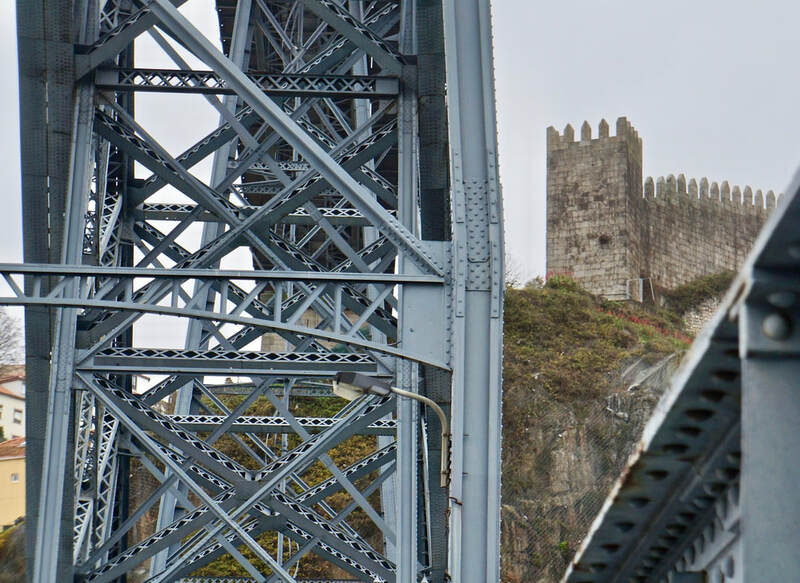 This 45 meter high double decker metal bridge was constructed in 1880 to span the Duoro connecting the popular Ribeira district of Porto with the port houses of Vila Nova de Gaia. This is the world centre for Port wine, of diminished importance today, but King of the after-dinner in the 19th century. At its construction in 1880, this 172 meters span was the longest in the world. It was named after the King of Portugal then, Luis I. The Dom signifies it was a gift for the King. This King, however, was one to avoid many of his royal obligations so at the bridge inauguration, he was not present. As such, the "Dom" was dropped and the bridge just took on the name, Luis I. The designer, Theophile Seyrig, assisted Gustave Eiffel in the layout of the neighbouring bridge constructed earlier and named after the wife of King Luis I, Dona Maria Pia of Savoy. In the past, the old bridge here consisted of old port boats lashed together and it was a challenge and a danger to cross it. Unhappily in 1809, when Napoleon invaded, so many drowned because of the stampede trying to escape his army. 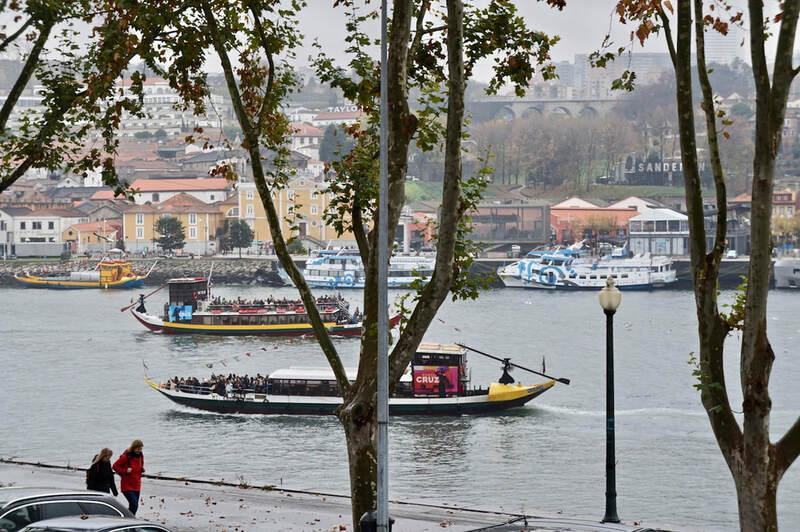 ​Today, the top has a pedestrian walkway and a dedicated line for the city's metro and the bottom walkway is for regular traffic between Porto and Vila Nova de Gaia and has narrow pedestrian walkways on each side. The tall bell tower of the Clerigos Church is a major landmark in the city as it can be seen from all ver the old city. The Church was built in a Baroque style for the Brotherhood around 1732 and 1750 by the architect, Nicolau Nasoni. The tower, however, was only constructed later, from 1754 - 1763. It is 75.6 meters high and 240 steps to reach the top of its 6 floors. Nasoni later joined the brotherhood and was buried in the church but where, is unknown. For us the important issue was the number of small al fresco wine shops and snack houses with local options. 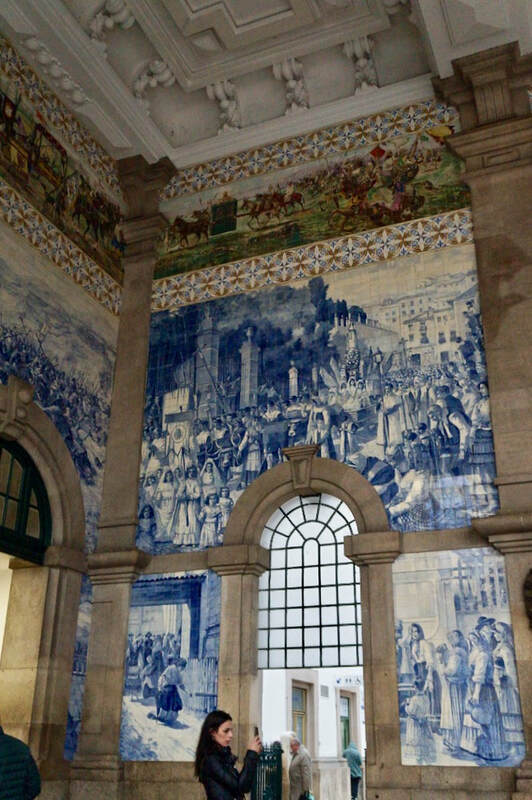 This magnificent Sao Bento railway station right in the heart of Porto has many stories to tell and tell it in the most Portuguese way, through its 20,000 azulejos placed together in murals depicting historical events on the royalty, the city, the wars and the country's history including the Battle of Valdevez in 1140 and the Conquest of Ceuta in 1415. 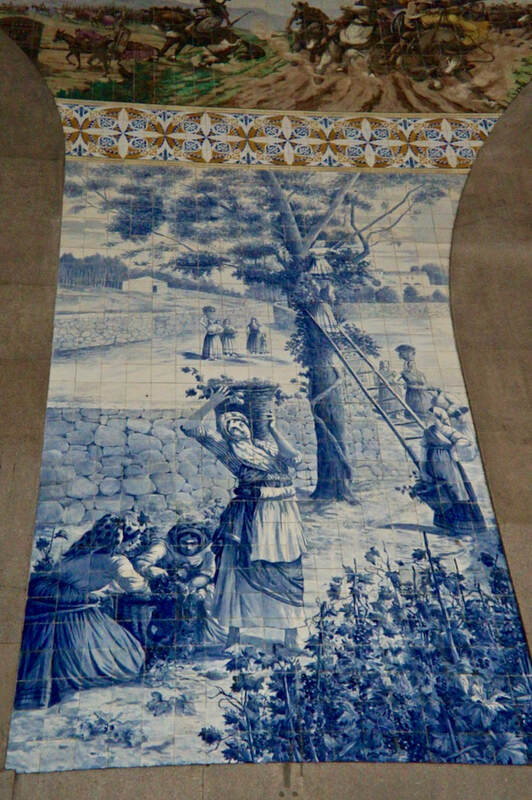 The artist, Jorge Colaco completed these tiles between 1905 - 1916. and the sheer size of them is stunning. ​This station was built on land which was occupied in the 16th century by the Benedictine Monastery of that same name. Sadly, the Monastery was destroyed by fire and although it was rebuilt, it had to give way to the expanding railway system. Jose Marques da Silva, the architect of this Station, created an impressively detailed edifice. ​If you did not use the railway station to come to the city, you must explore it and spend some time just revelling in the architecture and the tile displays. 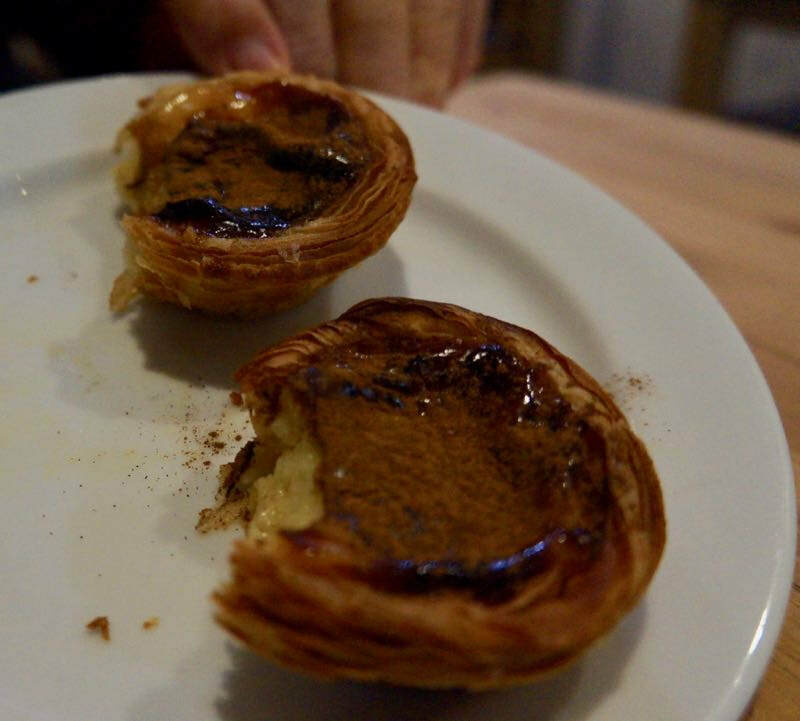 If you're on a tipple-themed Portugal jaunt, then the Port Houses in Vila Nova de Gaia is your destination. These are easy to find, clustered on the shore of the Duoro river across from Cais da Ribeira in Porto. Wander its streets and all the familiar Port names have places here and historic boats afloat as well advertising names like Sandeman, Taylor's, Graham's, Churchill's and the Portuguese owned ones like Vasconcellos. We stayed along Vila Nova de Gaia so this was an easy walk for us and having had an birds eye tour of the port houses, we chose to go in the Vasconcellos. I explained to the person how difficult it is for my husband to go up the stairs to their tasting floor and they ushered us to the ground floor room where they have private tasting for their serious clients. We specified the ones we wanted to try and we were really impressed so came out with purchases. 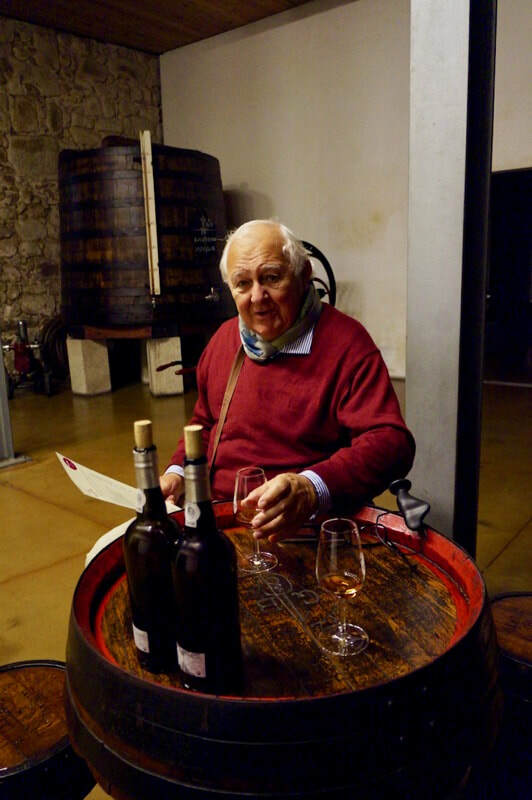 But the most memorable item for us was the experience of having our own private tasting with a very knowledgeable staff while the mass of shoppers could be heard upstairs. If you love Port, then, you must visit the Duoro Valley especially the town of Pinhao which offers some of the best cellars such as Quinta de la Rosa, Sandeman Quinta do Seixo and Quinta das Carvalhas. Other "must visit" port cellars are Quinta de Ervamoira and Fonseca's Quinta do Panascal located on the valley overlooking the Tavora River. Don't forget to try the different kinds of port including the white one. With tonic, it's one of the most enjoyable drink in the summer. 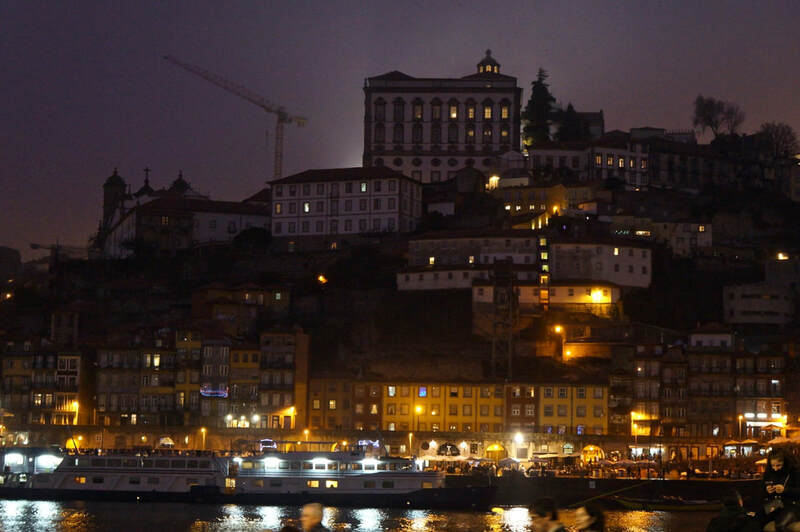 Aside from the port cellar tour in the Duoro Valley, a cruise on the River Duoro is one of the top things to do in Porto. 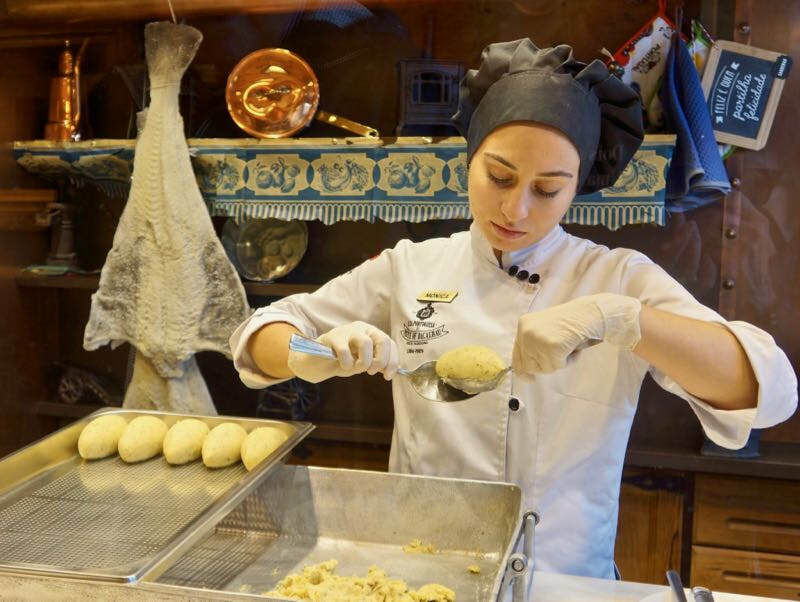 You can experience so many of the smaller communities along the river and sample some of their specialties. If you're a fan of Harry Potter, here's a bookstore to visit. When J.K. Rowling taught English in Porto, she frequented this bookstore and it was a major source of inspiration for her writing. 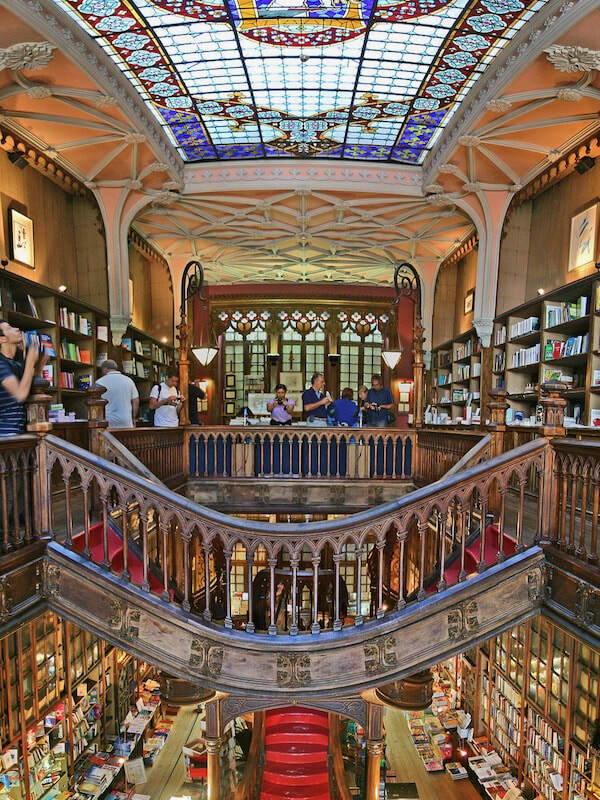 Sometimes referred to as Livraria Lello & Irmão and Livraria Chardron, this bookstore was started in 1881 by two brothers, Jose and Antonio Lello who dreamt of becoming booksellers as they had a passion for reading, books and culture. ​The building which houses the bookstore today was designed by the engineer, Francisco Xavier Esteves who combined neo-gothic with art nouveau and art deco. This engineer's love for literature inspired him to create an iconic building for book lovers, constantly listed as one of the top bookstores in the world. A historic building listed as a UNESCO World Heritage site, this used to be the Stock Exchange Palace built in the 19th century on the former St. Francis Convent by the Commercial Association of the city. Though no longer a centre of commerce, it attracts many visitors for its neo-classical style and its renowned Arabian Hall as well as the excitement of being inside a place only for bankers and investors in the past. Just the experience and the splendour of the Arabian Hall which was an imitation of the Alhambra Palace in Granada as well as the glass domed Hall of Nations is worth the ticket price. ​Opening Hours: Everyday from 9:00 a.m. to 6:30 p.m.
One can only truly appreciate the building when inside its magnificent halls and this video shows the interior beautifully. This Liberty Square signalled in the 18th century, the modernization of the city. A political, economic and social centre for Porto, the square is entered on the statue of Peter IV riding a horse and holding the Constitution he protected during the Liberal Wars. The square is now one of the most attractive to tourists with its restaurants, stores and cafes recreating some of the traditional favourites in the city. 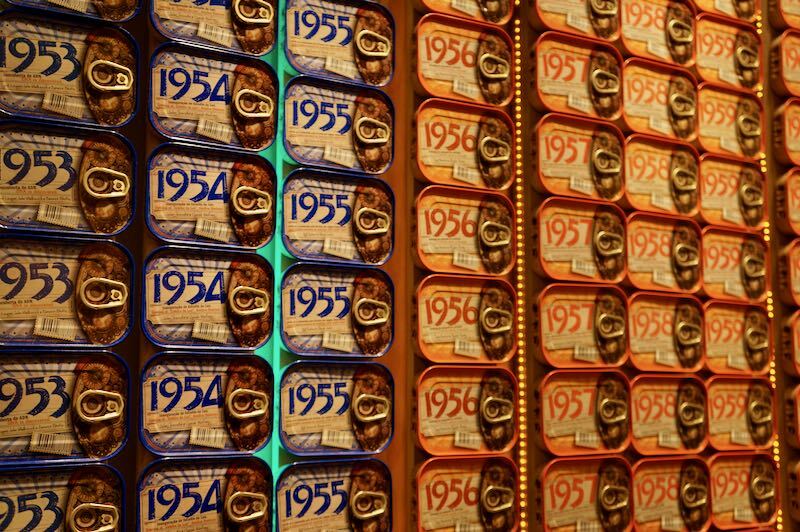 You can sample nata de bacalhau, pasteis de nate, or get a can of sardines in your year of birth. These walls constructed in 1336 covered the consolidated area of the medieval population in Porto and as the city expanded these are what remained of the medieval centre. Some of the walls were restored and today, it is interesting to go up and walk through the fortifications, the walls and the gates and as you walk there is much information on the medieval city of Porto and stunning views of the river to make the walk worthwhile. We happened to be in Afurada by chance. We walked following the shores from where we stayed and ended in this tiny fishing village very close to Porto but still undamaged by the deluge of tourists in the city. ​You can enjoy watching the fishermen mend their nets and the locals going to the bakeries to buy lunch. The restaurants do not yet cater to many tourists and you can enjoy having chats with the locals as you go in some of the stores. There is a museum there that tells the story of the fishing village and the lives of the fisher folks. It is really very interesting. You can look up the houses and see the patron saints in tiles marking the devotion of the family living in each of the houses. It is a fishing village that has plenty of stories to tell and is very accessible. You can take a boat in Porto and just a short ride brings you to this village. Porto is now starting to get a bigger slice of the travelling population and you can see many of the old houses being renovated to accommodate the influx of visitors. The city has so much to attract all kinds of tourists that it is best to visit now and enjoy more of its magic and authentic local culture. It will be buried by tourism soon, so go NOW.